Our fall workshop series at Blue Pearl Farms starts now! It is time to prune and plant blueberry bushes for a crop next summer. We focus on the information you need and provide hands-on experience to help you get the most out of the blueberry management workshop. Sunday, September 9 from 130 to 4 pm, come to the farm for an afternoon of blueberry immersion...and leave with your own field-dug rabbiteye blueberry plant. You can even taste a few of the season's last berries while you're here. Register at https://store.bluepearlfarms.com/products/blueberry-keeping-workshop for the workshop which also includes a $10 gift certificate for farm plants and products. Beautifully scented, aromatic companions in the kitchen, on the balcony or even in a window box, fresh herbs bring something special to your table, teas and cold drinks, and spices. Sunday, September 23, we have a space-limited workshop featuring a Build-Your-Own Kitchen Garden from our organic nursery plants, with segments on selecting, growing, and cooking with organic herbs from 2 - 4 pm. Each person will go home with a 10-inch garden in a durable pot stocked with organic herbs that reflect individual interests, and information about successfully growing herbs. Samples and recipes for herb teas, dips, salad dressings are included. 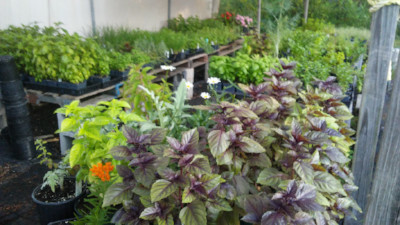 You will also receive a $10 gift certificate for Blue Pearl Farms plants and products as part of your registration package. The farm is fully stocked with honey, blueberry products, fall flowering plants, fresh herbs for your kitchen and perennial favorites. 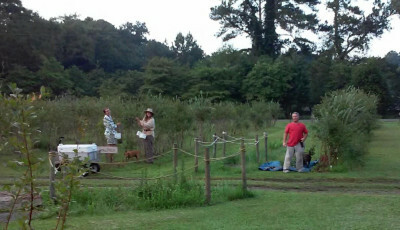 Our Certified South Carolina Roadside Market is open on Saturdays from 1 to 5 pm and Sundays from noon to 4 pm. Text or call our crab line at 843-630-0226 for information about ordering Blue Pearl Farms quality live blue crab or stone crab claws from us.